Dear Earth Talk: Is alternative energy still the next big thing for American venture capitalists? A decade ago, in the wake of Al Gore’s An Inconvenient Truth and rising gas/oil prices, many of the same venture capitalists (VCs) who had made fortunes betting on software, hardware, internet and biotech start-ups began shifting significant chunks of their investment dollars over to alternative renewable energy and related investments, putting the socalled “cleantech” sector in the spotlight as the “new new thing.” Given growing global concern about greenhouse gas emissions and other pollution, it made sense that our highest stakes investors would be attracted to placing big bets on little companies jockeying to be the next major players in the fast-growing alternative energy sector. So where did cleantech go wrong? Unlucky timing may have had something to do with it, given the overall market collapse at the end of 2008. 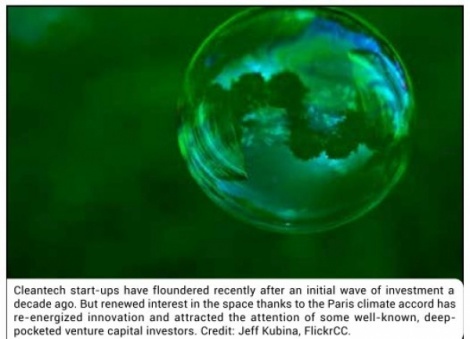 But the MIT researchers point out that cleantech start-ups have a longer timeframe of growth than, say, software ventures - and VCs don’t want to wait around for 15-20 years to cash in on their bets. Also, the cleantech sector suffers from underdeveloped supply chains and an “immature acquisition space” compared to more conventional tech startups. The result is that most of the 150 renewable energy start-ups launched in Silicon Valley since 2006 are long gone. The flame-out of high-flying solar tube manufacturer Solyndra - after securing $500 million in federal loan guarantees - undermined investor confidence in cleantech, while cheap natural gas and a glut of Chinese solar panel exports undercut the competitiveness of American start-ups in the sector. But cleantech’s fortunes may be turning around, given an influx of interest in leveraging technology and efficiency to help the U.S. meet its emissions reduction commitments under the Paris Climate Accord. Just prior to the landmark December 2015 Paris meeting, Bill Gates announced he was launching a new venture fund, the Breakthrough Energy Coalition - with a little help from 27 mega-rich friends like Jeff Bezos, Richard Branson and Mark Zuckerberg. The nascent billiondollar fund is focused on “fighting climate change by investing in clean energy innovation” and represents a new type of venture financing that aims to not only make money, but to help solve social and environmental problems as well. Gates and company are optimistic that other funders will follow in their footsteps to re-energize American cleantech innovation, create millions of new domestic green jobs, and help finally move us beyond fossil fuels. CONTACTS: MIT Energy Initiative, energy.mit.edu; Breakthrough Energy Coalition, www.b-t. energy.com. EarthTalk® is produced by Roddy Scheer & Doug Moss and is a registered trademark of the nonprofit Earth Action Network. To donate, visit www.earthtalk.org. Send questions to: question@earthtalk.org.